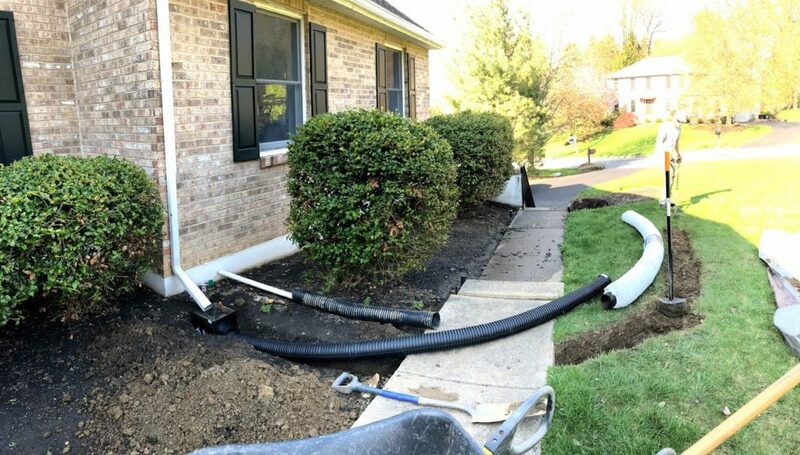 The water that came off the roof from rain went down the gutters and drained into the landscaping and basically just held into this area and had no where to go. Over the years, it weakened the foundation and walls in this area. It was apparently discovered a few years before we bought it, the last time they tried to sell the house on the inspection. They had to bring in a structural engineer and team to add in more support and rebar to the area to make it structurally sound again. 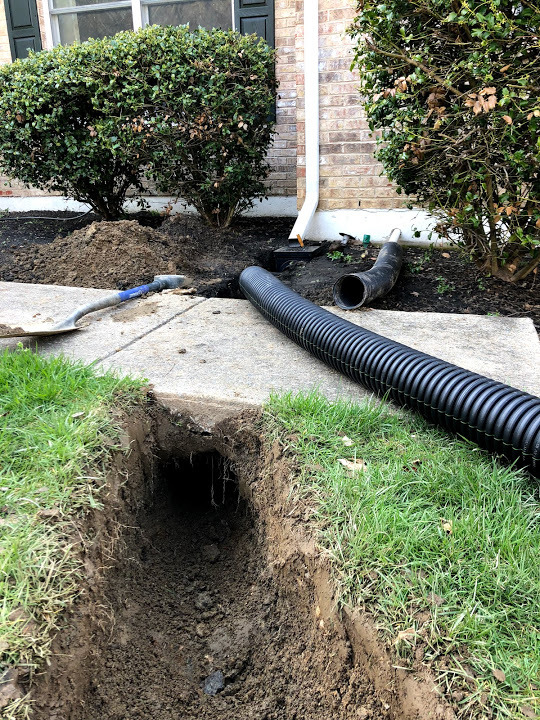 There were holes drilled into the wall to allow for drainage of water down the wall… and then into the driveway… don’t get me started on that now, I’ll talk more about that later. Basically they just diverted the problem. So. 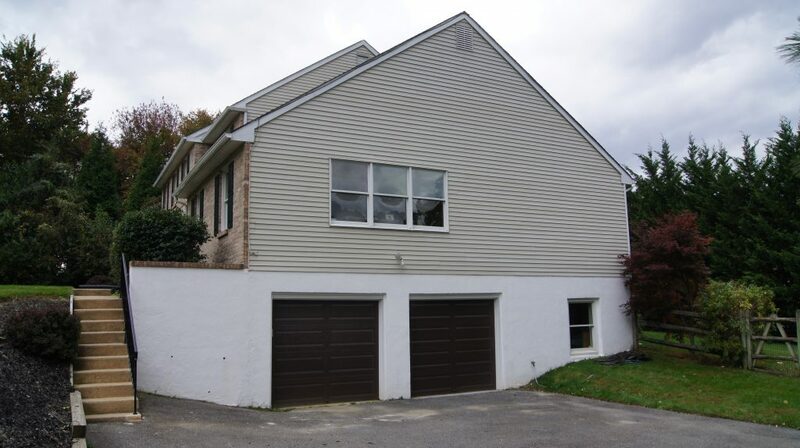 Once that was completed, apparently the buyers changed their mind, didn’t buy the house, the sellers decided they didn’t want to sell, and then took it off of the market. A year or two later, they put it back up, and it sat for awhile until we found it. 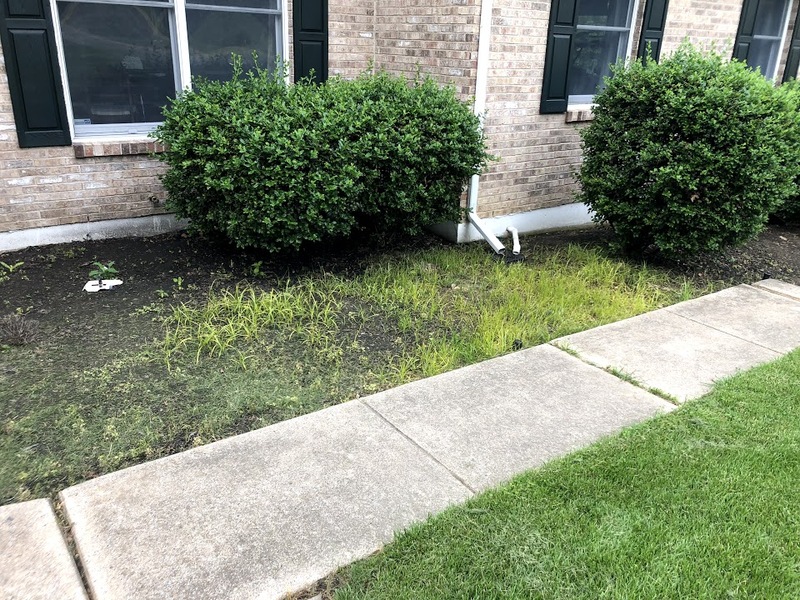 During our inspection, the inspector found out that the inner wall in the garage was damp, and the drainage holes in the outer wall weren’t doing enough to get rid of the water. One of our terms on buying the house were dependent on the owners fixing and paying for this issue. We brought in a waterproofing company in who came in and dug a trench in the garage to collect the water coming down the wall, and installed a sump pump that pumped out the water and sent it back up to the front of the house. 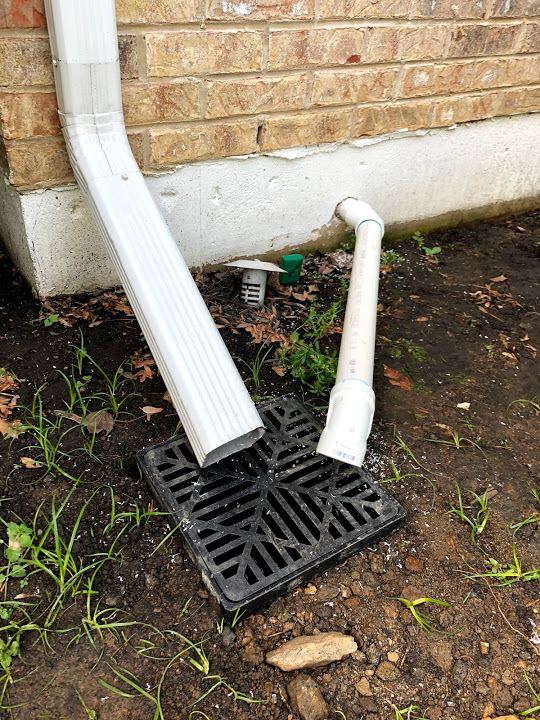 It definitely fixed the wet wall and drainage issue, but, it was really just pumping the water back up into the landscaping, rather than sending it somewhere else more helpful. You can see our temporary solution above, the black pipe was was an extra piece we had in our stock to extend it out a little and send it into the yard. Well, this temporary fix stayed there for about 2.5 years, and since we decided that we’re doing mulch this year, this was the year to finally fix it. 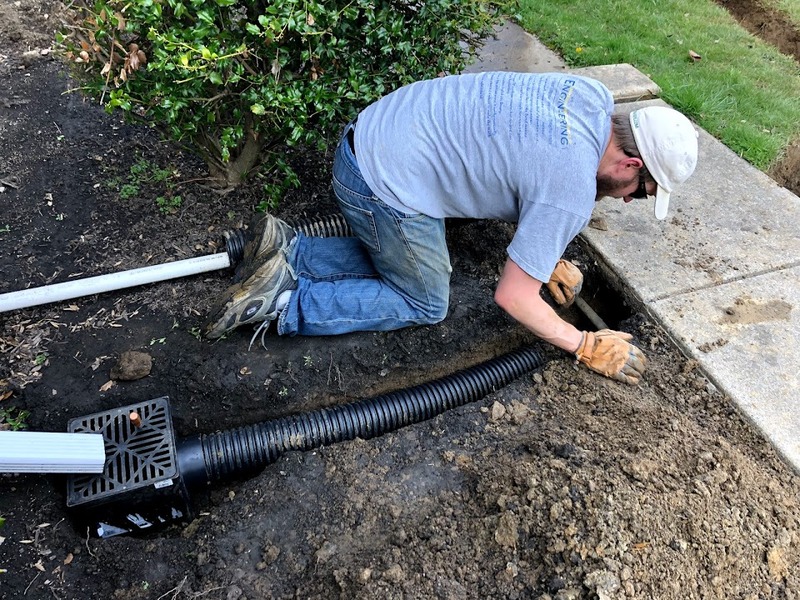 We decided to install a catch basin for both the rain gutter drainage and the sump pump pump-out that would drain into a pipe line and into a french drain underneath the walkway and out farther into the yard. 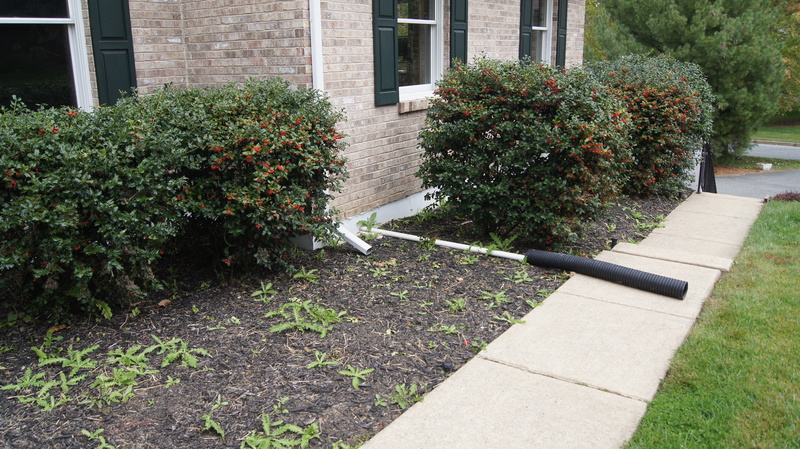 The catch basin is directly under the gutter spout. 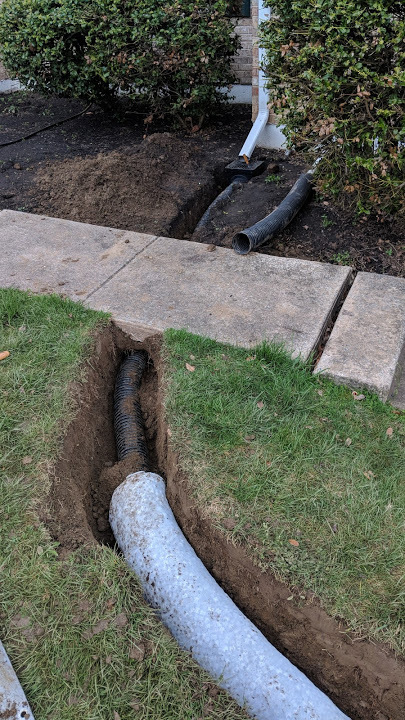 The black corrugated piping would act as a transport line to take the water further away from the house, and then the punched black corrugated piping with the large white jacket around it is where the water gets dispersed. 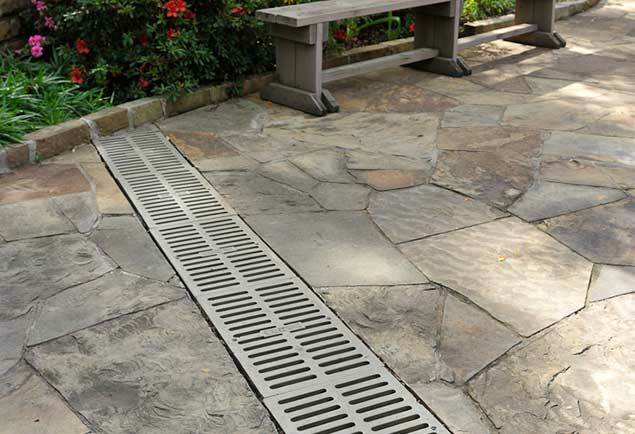 This is the actual french drain portion, THIS ONE is the one we bought. 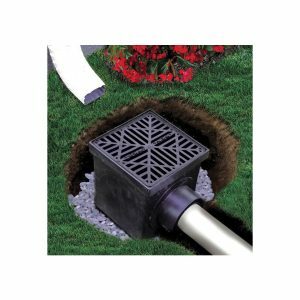 It’s not a cheap item, but it allows you to just lay down the piping into the ground without having to add in sand and gravel for proper drainage since the packing peanuts do this job. We installed one of these in our Maryland house and were pretty happy with it, so we were sure about doing it again. 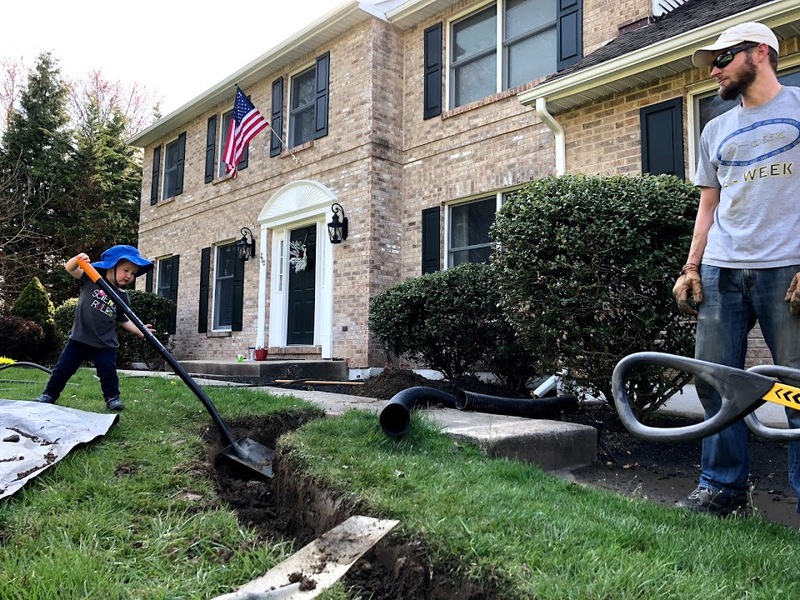 David had to dig a hole underneath of our walkway, and did it relatively quickly. I thought this was going to be the hardest part. You can see in this photo below another one of the sprinkler lines that David had to dig around. And he may or may not have created another leaking point because he didn’t realize there would be a line here. Sigh haha. So it’s all patched up and installed. David did such a great job with this, I take absolutely zero credit. He got it all finished up before that massive week of rain that we got not too long ago too, so it was perfect! 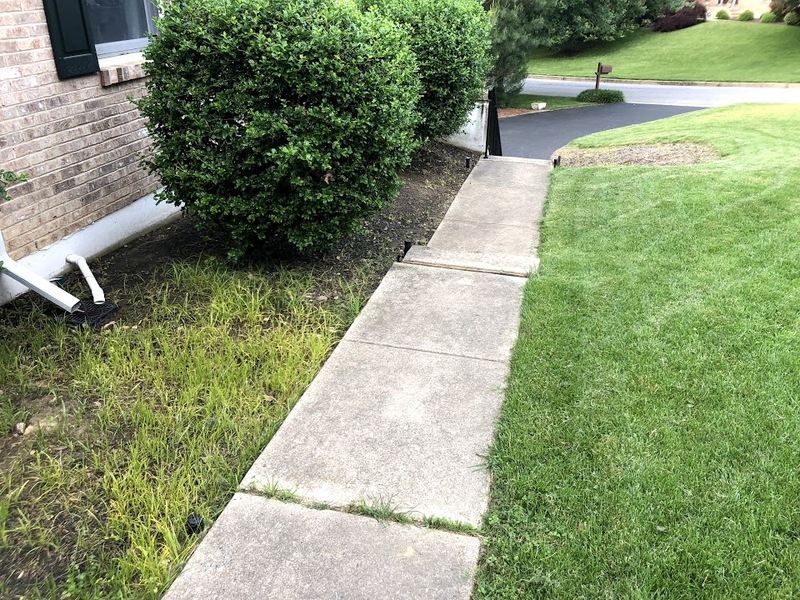 He patched the grass back up perfectly! 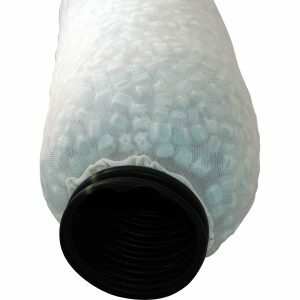 So, overall, this definitely helps our drainage issues, BUT it doesn’t solve them all. Our problem now, is that since this part of the yard sits so high up, it drains downhill. 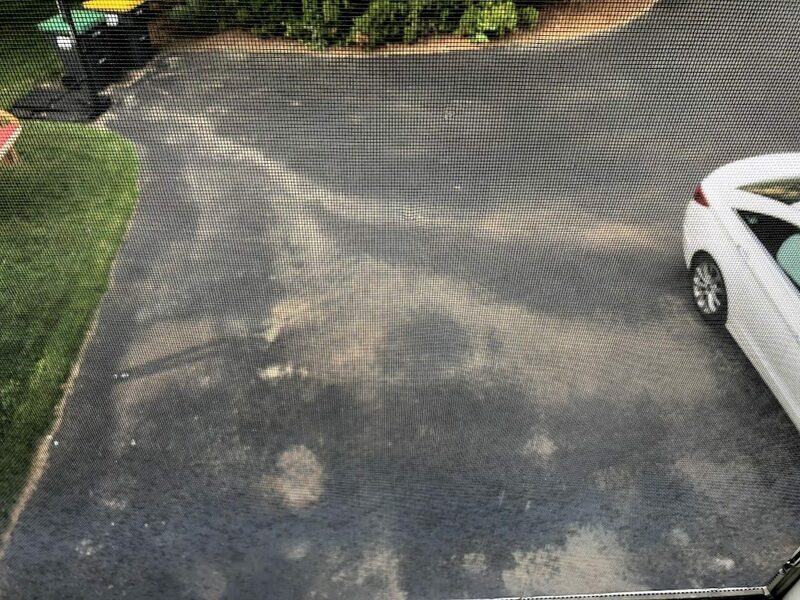 And downhill is into our driveway, which collects puddles, especially around our garage doors. 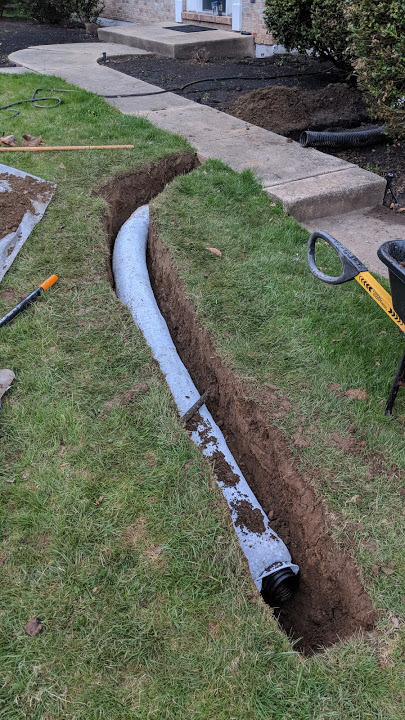 I got sucked down a YouTube black hole of watching channel drain and trench drain installation videos and how some of them you can DIY, but it looked like a ton of work. We’ll see how we feel in the next few years. 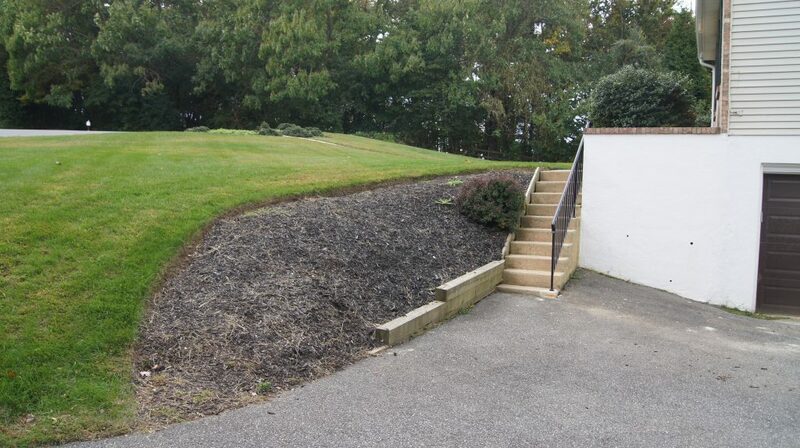 Water is not an easy problem to solve, but we didn’t think it was a big enough deal to deter us from buying this house. 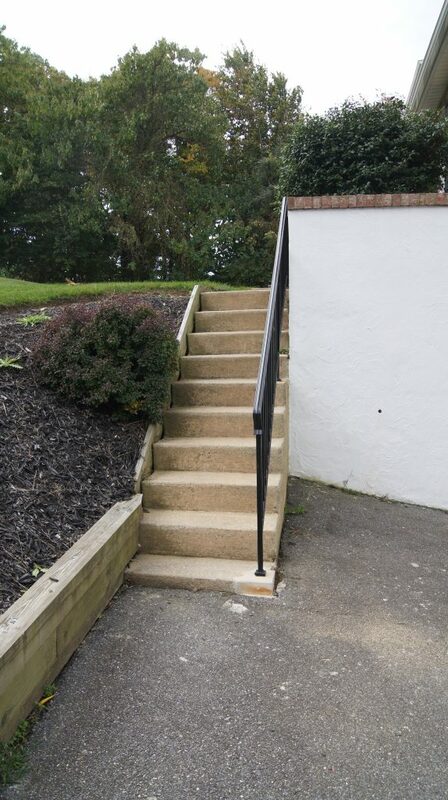 We knew it was going to be a fixer upper for us, but all the work was manageable. 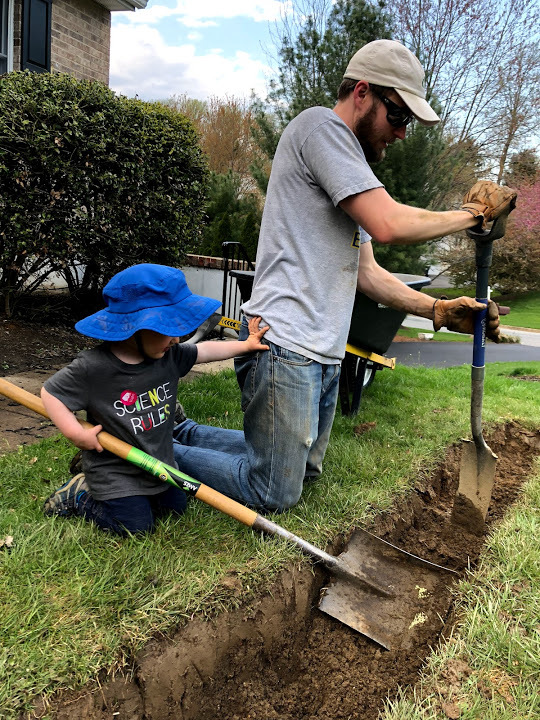 Hopefully we can continue to do most of it ourselves, but there are some projects like these that may need more tools and expertise than we have. Now onto the weeding and mulching of this mess! How about you? Do you have any drainage issues that could use a french drain? It’s definitely been a learning experience for us over the years!